Staving off mass depression, one house at a time. It’s that most beautiful time of the year again, when houses are dressed in twinkling colored lights, schmaltzy Disney characters, and severed tree limbs wrapped in ribbon. Snowmen, frolicking deer, and candy canes adorn yards and driveways. Halloween is nothing but a distant memory and Thanksgiving has been trampled underfoot by the horde of consumer-goods obsessed holiday shoppers. And yet, a majority of houses in our neighborhood remain shrouded in darkness. So let’s just get one thing straight- I don’t care if you celebrate Christmas or if you are Christian, you need to get a few strings of light out and slap them along the porch rail. It’s not about YOU. It’s about staving off depression. We aren’t Christians either but that doesn’t stop us from getting into the holiday spirit. The reason for *our* season is not religious tradition but weather. Don’t think it’s an accident that many religious and cultural traditions are clustered around this time of the year. Fall and winter are chock full of holidays because otherwise we’d all go mad. It’s cold, it’s dark, it’s dreary, and if not for the parties, the lights, the festive meals, and the gift giving, people would huddle inside their homes having existential crises. They would cocoon themselves in unwashed sweatpants, eat gallon after gallon of ice cream, watch foreign films or reruns of Fantasy Island, and weep for what might have been. Over the years, religions and cultures have realized that as a matter of self-preservation, it’s important to focus us humans on something more uplifting than the fact that it gets dark at 4:30 in the afternoon (at least here in the far north of North America- I shudder to think how Canadians cope- Whiskey, I suspect) and that there isn’t a fresh vegetable in sight. Okay, that last bit isn’t true any longer with the relatively recent globalization of vegetable production. But rock-hard fruit cake and hearty stews at this time of year grew out of the fact that the gardens had all died and the only vegetables you had to eat were either stored in a root cellar or canned. I still remember looking forward to avocados and the return of guacamole as a kid. Now, avocados are cheap and plentiful year-round. It just doesn’t taste as sweet without six months of anticipation. This year, my daughter has to do a report on a special family tradition in our house…. Hmmmm, we’re a little short on the conventional ones. It seems boring to talk about Thanksgiving- it would be like serving leftover turkey AGAIN (and I just dumped the last of the gravy down the drain). We don’t worship or pray… but it turns out we do rejoice and celebrate and we do have a strict calender that we follow- I like to think of it as the 5k calendar. Our 5k calendar of celebrations keeps us smiling all year long! There’s the St. Patrick’s Day Run, the Mother’s Day run, the 4th of July Run, the Derby Days Bike Parade, the Pride Parade, and the Pineapple Classic. All are looked forward to. Most involve costumes. These tasty appetizers lead up to the big three that (as noted above) coincide with shorter, cooler days- the Running Scared 5k, the Turkey Trot, and our high holy day- the Jingle Bell Run. Yes, my daughter will be presenting the Locati family’s greatest, most sacred event of the year- the Jingle Bell 5k. We brave the cold, we dress up, we put on bells, we invite friends, we bring thermoses of hot chocolate to fortify ourselves, and then we run through the city- laughing, reveling in the camaraderie of fellow worshipers who have agreed to make merry and bright on a chilly morning in December. You simply can’t be depressed and grinchy when surrounded by 5,000 other elves, santas, gingerbread men, and whatever else can be wrapped in ribbon, bows, and bells. For us, it’s not about an ideology, though I wholly subscribe to the idea of loving one another, giving to those in need, reaching out to friends and loved ones and telling them how much they mean to me. I am dedicated to the idea of making the long days of winter brighter, merrier, more filled with laughter and joy, than they would be if we relied on Mother Nature alone. So put aside your stuffy objections and join in the fun- I don’t care what religion you are (or are not). I love the Diwali lights that sprang up across our neighborhood! Heck, I might put some up next year too. But people- seriously. I am counting on you. I want to turn down my street in the evening on December 24th and have it look like I just pulled up on Main Street USA in Disneyland. 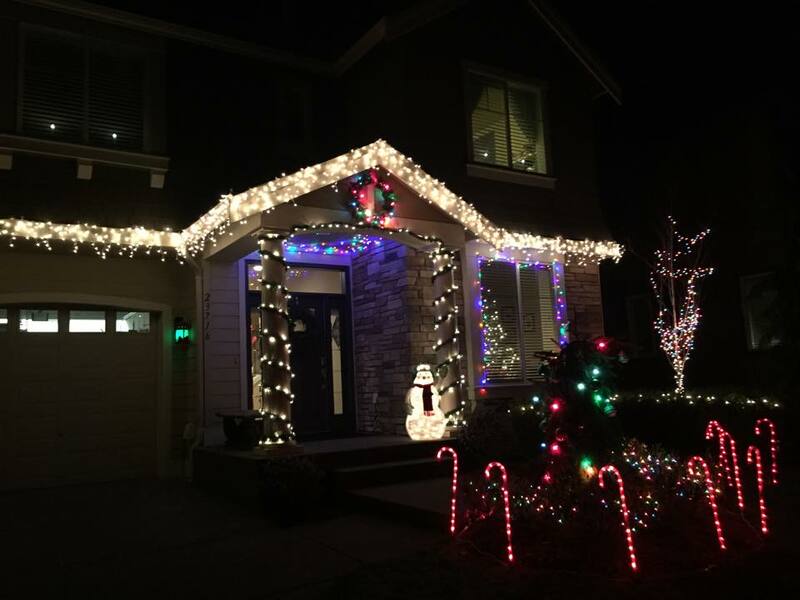 Lights, happy children, delicious treats, smiling neighbors. I don’t think you are too busy- they sell Christmas lights at the grocery store, the gas station, and you can even hire someone to put them up for you. You want to get the kids out of the house anyway- have them throw a few strings on the bushes and call it good. 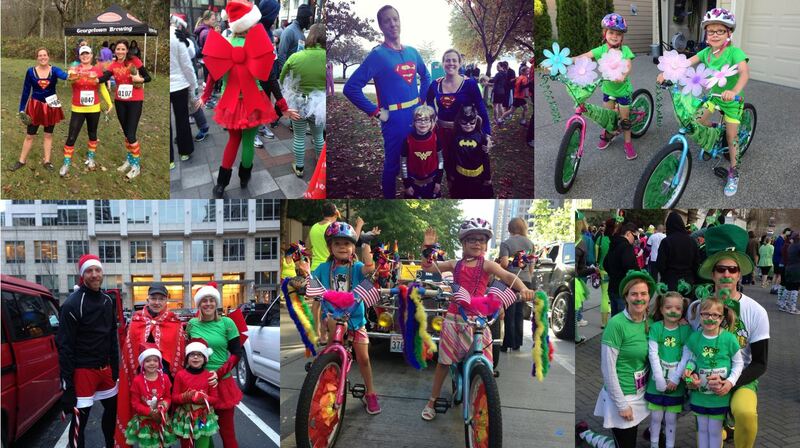 I hope to see you for this year’s Jingle Bell Run too! I’ll be the one with bells on. And lights on. And tulle- lots and lots of tulle. Oh, and a shining, golden star atop my handmade Christmas tree costume. I’m not afraid to say my costume is magnificent this year! Joy. Happiness. Friends. Family. Getting off your duff and getting some exercise. It’s truly the most wonderful time of the year! Posted on December 8, 2014, in Big Ideas and tagged 5k, Celebrate, Christmas, Depression, Diwali, Halloween, holidays, Jingle Bell Run, lights, St Patricks Day, Thanksgiving, Turkey Trot. Bookmark the permalink. 2 Comments. Bah humbug! I am going home to put up the lights because you are YET AGAIN very convincing! LOVE it!